Lost in the buzz of the draft over the weekend was the fact that the Denver Broncos quietly signed a free agent—former San Diego Chargers outside linebacker Shaun Phillips landed in Denver on Saturday. The one-year deal is worth $1 million with the possibility of increasing to $3 million based on sack-based incentives, according to the Denver Post's Mike Klis. Phillip's $1 million deal is a big bargain for the Broncos considering that he earned a base salary of $4.4 million in San Diego last season, per Spotrac.com (link requires Premium subscription). After Pro Bowl defensive end Elvis Dumervil was released by Denver and signed by the Baltimore Ravens earlier in the offseason, pass rusher quickly became a position of need for the team. In addition to fifth round draft pick Quanterus "Q" Smith of Western Kentucky, Phillips will help fill the production void created by Dumervil's absence. In San Diego, Phillips was an outside linebacker, but he has experience playing with his hand on the ground. “I played [down] all the time in San Diego, so I was up and down most of the time, but I’ve played defensive end my whole career,” Phillips told the press over the weekend, implying that transitioning from being a 3-4 OLB to a 4-3 DE should go over smoothly for the 31-year-old veteran. But Phillips will not play strictly at defensive end—Coach John Fox noted that he will be Von Miller's backup. Miller is Denver's "SAM"—strong side outside linebacker—in the Broncos' 4-3 base defense, but he is moved around by Defensive Coordinator Jack Del Rio, who frequently has Miller line up with his hand on the ground. "(Phillips) played outside linebacker in a 3-4," Fox said in a post-draft press conference at Dove Valley on Saturday afternoon. "In essence, that's the same thing (as a 4-3 defensive end). That's basically how we use Von and whoever the right (defensive) end is." Phillips can move around—Fox called him a "flex-like" player and compared him to Miller. "He'll have flex (to move from) 'SAM' linebacker as well as being that open (defensive) end, which is Robert Ayers' [job] now. He will be a valuable asset." As of now, Ayers and second-year defender Derek Wolfe are the right and left defensive ends, respectively. Phillips' versatility will give the Broncos a third option. Prior to the draft, the Broncos were looking at free agent veterans Dwight Freeney (33) and John Abraham (34). 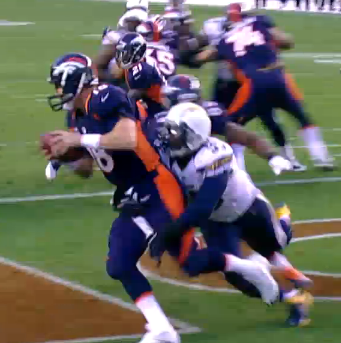 Phillips (31) is younger than both and seemingly fills the need at pass rusher, so is Freeney now out of the equation? "We never stop looking," said Broncos Executive V.P. of Football Operations John Elway, "but I'd say we are pretty happy with where we are. We never say never, but we're pretty satisfied with the pass rushers we have—but we never shut the door." Translation: Bringing in another veteran hasn't been ruled out, but is not a priority. Having played with one of the Broncos' biggest division rivals, San Diego, for the past nine years, Phillips is very familiar with Denver, and vise versa. Since 2004, Phillips has recorded 69.5 sacks—7.0 of them have come against the Broncos and 9.5 of them came last season. "I'm on the good side now," Phillips said. "I'm excited. It's going to be fun."